Our previous research on younger Americans’ reading habits has shown that the youngest age groups are significantly more likely than older adults to read books, including print books; reading and research required for schoolwork contributes to this, along with a decline in overall reading rates for adults ages 65 and older. 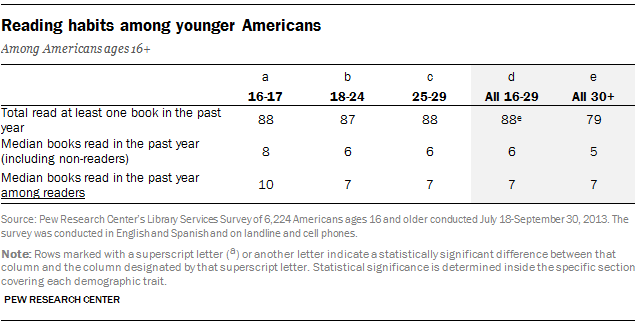 As a group, younger Americans under age 30 are more likely than those 30 and older to report reading a book (in any format) at least weekly (67% vs 58%). Adults ages 50-64 are least likely to report reading books on a weekly basis, followed by those ages 30-49 and those ages 65 and older. In response to a different question about the total number of books read in the past year, we found that younger Americans are also more likely than older adults to have read at least one book in that time (88% vs 79%). 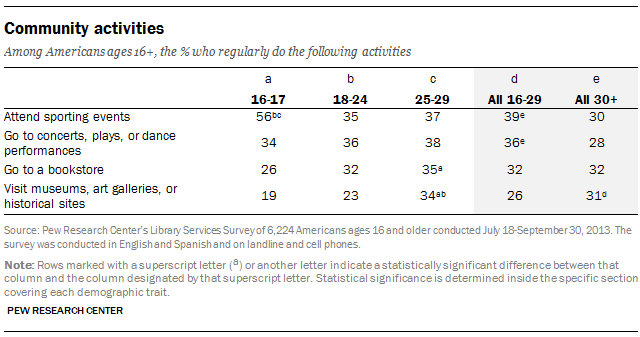 As in other surveys, adults ages 65 and older are the age group least likely to have read a book in the past year. Among those who read at least one book in the past year, a majority said they tend to purchase most of their books. Some 52% of all readers under age 30 said they purchase most of their books, while 39% of those under 30 say they tend to borrow most of their books—similar to the overall responses of older readers. Those ages 16-17 who are book readers are most likely to borrow most of the books they read (54% say this). All older age groups, including those ages 18-24 and 25-29, are more likely to purchase their books than borrow them. 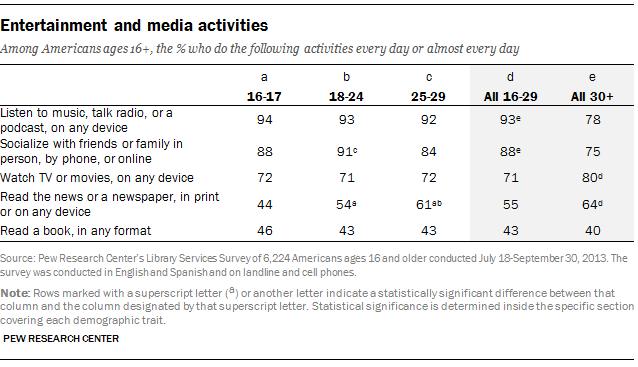 In the process of creating our library engagement typology, we examined a range of activities that might help us learn more about other community activities Americans are engaged in, as well as relevant media consumption and technology usage habits. These questions are not comprehensive, but do help provide some context for Americans’ library use. Looking at a range of community activities, we found that some 39% of younger Americans under age 30 attend sporting events regularly, and 36% attend concerts, plays, or dance performances. Some 32% visit bookstores regularly, and 26% visit museums, art galleries, or historical sites. More than half (56%) of older teens ages 16-17 regularly attend sporting events, making them more likely to do this than any other age group; however, they are less likely to visit bookstores regularly than young adults in their late twenties (26% vs 35%). Young adults ages 25-29 are also more likely than younger age groups to visit museums, art galleries, or historical sites regularly. Meanwhile, the rates of regular bookstore attendance and museum visits of young adults in their late twenties are similar to those of adults in their thirties and forties. In terms of general entertainment and media consumption, we found that 93% of respondents under age 30 listen to music, the radio, or a podcast in some format on a daily or near-daily basis, compared with 78% of those 30 and older. Younger Americans are also more likely to socialize with friends or family daily (88% vs 75%), but are less likely to watch TV or movies (71% vs 80%) or read the news (55% vs 64%). 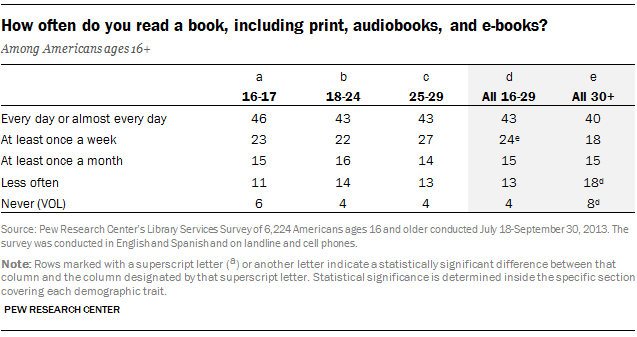 About four in ten Americans reported reading a book—in any format—on a daily basis, with no statistically significant differences between those ages 16-29 (43%) and adults 30 and older (40%). 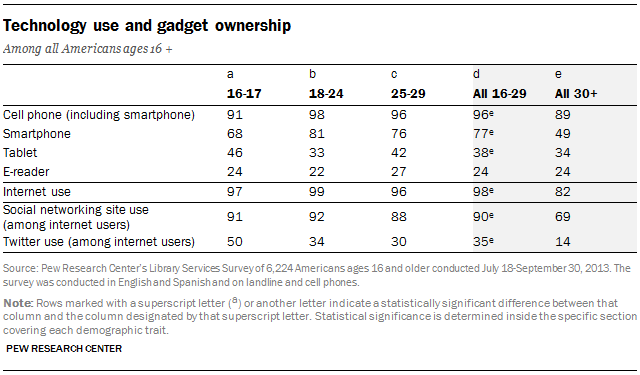 Younger Americans typically have higher rates of technology adoption than older adults, with 98% of those under 30 using the internet, and 90% of those internet users saying they using social networking sites. Twitter use among online 16-17 year-olds jumped to 50% in this survey; previous Pew Research data shows that teens have started to augment traditional social networking sites with smaller services such as Twitter, Instagram, and Snapchat, though the vast majority still maintain a presence on Facebook. In order to dig deeper into the larger context surrounding Americans’ relationships with libraries in the digital age, we also presented respondents with a series of statements about the impact of the internet. Respondents of all age groups generally agree that the internet makes it much easier to find information today than in the past, and most Americans feel that it’s easy to separate good information from bad online. However, Americans under age 30 are actually more likely than older adults to say that there is a lot of useful, important information that is not available on the internet. They also believe that people without internet access are at a real disadvantage because of all the information they might be missing.